It’s been a long time coming but that highly sought after open source mixer, the aurora224 is now available for purchase on the company’s website. 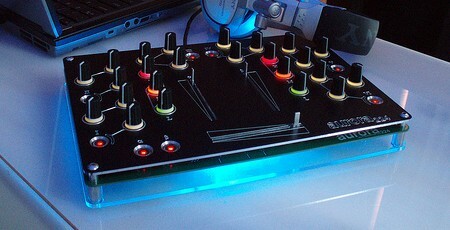 The aurora mixer is a fully programmable USB mixer complete with 24 back lit knobs, 2 faders, and a single crossfader. While the instructions on how to assemble your own mixer from scratch have been available for sometime now, many wanted a kit complete with everything needed to avoid having to source the parts themselves. The aurora mixer is available in 2 versions, a fully assembled turn key deck and a DIY kit that requires the use of a soldering iron and the ability to follow directions. So, if you’ve wanted to build your own aurora mixer but never knew where to start, this may be your lucky day. Don’t wait too long as you have until September 1st to get your order in. We’ve seen some fairly impressive mixer projects this year, and the Aurora mixer is no exception. 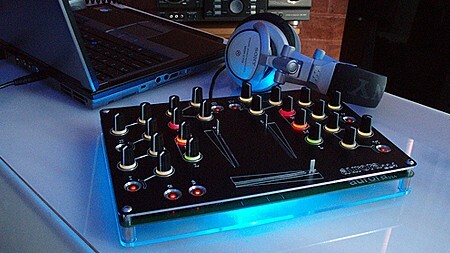 It is a dual channel USB-powered mixer with two linear faders, one crossfader, eight backlit buttons and 24 potentiometers, all built around a PIC 18LF4525 microcontroller. That’s all pretty typical for a mixer, but this one is very visually attractive, featuring a clean and stylish form factor and controllable lighting both under the board and in the LEDs backlighting the buttons and knobs. Whether you want to buy one now or build one yourself, the Aurora team has made both possible. You can contact them for pricing if you are ready to buy. If you prefer to build, this is an open source project with full assembly instructions, schematics, drivers, patches and all other source code and information you should need available here. See more photos of the Aurora mixer here, or see it in action after the break.